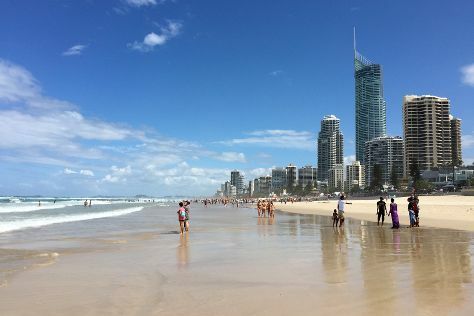 Discover out-of-the-way places like Stand-Up Paddleboarding and Kirra Beach. Explore the numerous day-trip ideas around Gold Coast: Lennox Head Beach (in Lennox Head), Tweed Regional Gallery & Margaret Olley Art Centre (in Murwillumbah) and Byron Bay (Spas & Wellness, Kayaking & Canoeing, & more). Spend the 1st (Fri) exploring nature at Natural Bridge. Spend the 4th (Mon) exploring nature at Springbrook National Park. The adventure continues: find something for the whole family at Sea World Theme Park, cool off at Dreamworld, whizz through the canopy at some of the top local zipline courses and adventure parks, and explore the striking landscape of Burleigh Head National Park. To see traveler tips, photos, where to stay, and more tourist information, read our Gold Coast online trip itinerary planner . In January, plan for daily highs up to 33°C, and evening lows to 24°C. Wrap up your sightseeing on the 8th (Fri) to allow time to travel back home.